With over 100 diseases that can attack soybean crops, why would charcoal rot rise to the top of the most wanted list? University of Illinois scientists cite the earth's changing climate as one reason that more research is needed on the fungus that causes charcoal rot. Fungi may often be associated with cool, damp growing conditions but Macrophomina phaseolina, the fungus that causes charcoal rot, prefers hot and dry drought conditions. "As the climate continues to change and we see more extremes in the weather, including hotter, drier summers, this fungus will have more favorable conditions to gain a foothold in soybean and other crops," said Osman Radwan, a U of I molecular biologist. "If we look at diseases of soybean, we find that soybean cyst nematode (SCN) is at the top, but in the past decade or so, charcoal rot has become one of the top 10 diseases that affect soybean yield." In examining previous studies on charcoal rot, Radwan and his team noticed that worsening weather conditions associated with climate change, such as higher heat and drought, brought an increase in the incidence of charcoal rot in soybean. He suggests that a research strategy be created to develop a high-yielding soybean that is both resistant to charcoal rot and drought tolerant. "Right now we are screening lines of soybean to charcoal rot and drought stress, in collaboration with Glen Hartman, a USDA-ARS and U of I plant pathologist," Radwan said. "His team is screening for charcoal rot resistance, and I am screening for drought tolerance," Radwan said. "Our ultimate goal is to identify the line that shows resistance to both charcoal rot and drought stress and in this way improve soybean tolerance to both the pathogen and the extreme weather conditions." The review of research on the subject has been written along with Hartman and Schuyler Korban from U of I. Radwan said that this background for what's already been done on the topic will help them to develop a strategy for the next step. Radwan emphasized that it's not just soybean crops at risk. The fungus causes charcoal rot in about 500 other host plants, including corn, sorghum, sunflower, and other important crops. This fungus also grows in high concentrations of salt, which isn't much of a problem to growers in the United States, but it is for farmers in developing countries where salinity is considered an issue. Consequently, the plant must be able to tolerate drought, salt, and resist this fungus at the same time. One intriguing direction Radwan described that shows promise is that there may be interactions between M. phaseolina and other soil pathogens such as soybean cyst nematode (SCN) and sudden death syndrome (SDS). "We have some assumptions about whether SCN can increase or decrease the incidence of charcoal rot as resistance to both pathogens might be controlled by two different pathways," Radwan said. He explained that biotrophic pathogens such as SCN need plant tissue to survive, but the fungus that causes charcoal rot is necrotrophic, meaning that it kills the plant tissue, then lives on the dead plant cells. "We need to understand at the molecular level how these two pathogens interact when they are present in soybean fields. Understanding the mechanisms of molecular interactions between SCN and M. phaseolina will help molecular biologists and breeders to design an effective method to control both diseases and to breed soybean for resistance to both pathogens," he said. Although no plants have complete immunity from the fungus, some soybean lines have been shown to have partial resistance to it. Hartman's group has already begun screening many lines in soybean for resistance to charcoal rot. In controlled greenhouse conditions, Radwan grows a variety of soybean cultivars in sandy soil and then stops watering the plants to simulate drought. 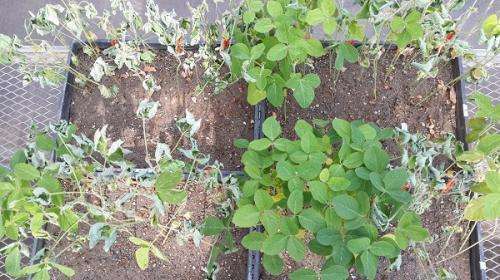 The susceptible ones wilt and, even after adding water, don't recover. Those that are tolerant to drought survive. "If we screen for drought stress, we hope to find some cultivars that are charcoal rot resistant and others that are drought tolerant so that we can cross them," Radwan said. "Of course, they also must have good agronomic traits, such as having a high yield potential, in order to be acceptable to farmers."